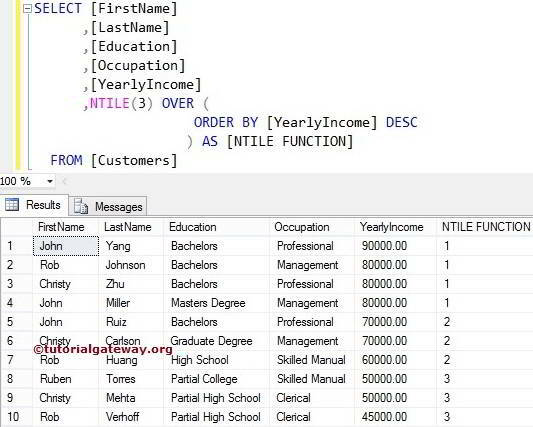 The SQL NTILE Function is one of the ranking function in SQL Server. This function will assign the rank number to each record present in a partition. Integer_Value: NTILE Function will use this integer value to decide, the number of ranks it has to assign for each partition. For instance, If we specify 2, SQL NTILE Function will assign 2 rank numbers for each partition. Partition_By_Clause: This will divide the records selected by the SQL SELECT Statement into partitions. If you specified the Partition By Clause then, NTILE Function will assign the rank number to each partition. 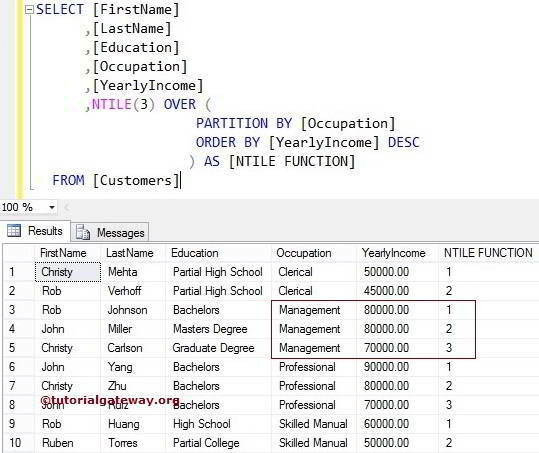 If you haven’t specified the Partition By Clause then, SQL NTILE Function will consider all the records as a single partition so, it will assign the rank numbers from top to bottom. Order_By_Clause: This is used to sort the Partitioned data into specified order. Please refer SQL Order By Clause for better understanding. The SQL NTILE Function allows you to assign the rank number to each record present in a partition. In this example, we will show you, How to rank the partitioned records present in a table. The following SQL Query will partition the data by Occupation and assign the rank number using the yearly income. In the below statement we used NTILE(2) Function with Partition by clause. Here integer value is 2, It means SQL NTILE Function will assign two rank number for each individual partition (4 partitions). Although the yearly income of is not same for 6 and 7 records (90000 and 80000), It has given the same rank to them because NTILE(2) can assign only 2 two ranks for a partition. In this SQL ntile example, we will show you, What will happen if we assign a different value at the Integer_Value position. The following example Query will use the above example query but we changed the NTILE (2) to NTILE(3). Above query will assign three rank number per partition. Although the yearly income of is same for 3 and 4 records (80000), It has given different rank to them because NTILE(3) will assign 3 ranks for a partition. 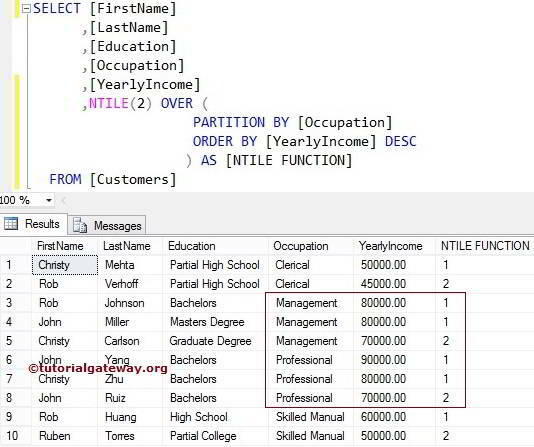 In this example we will show you, What will happen if we miss the Partition By Clause in NTILE() Function in Sql Server. 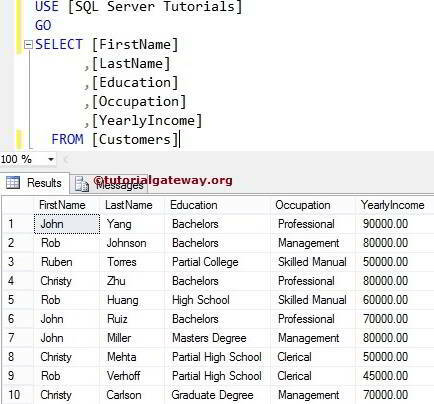 For instance, The following SQL NTILE Query will use the above example query without Partition by clause. In the below statement we used NTILE(2) Function without Partition by clause. Here integer value is 2, It means SQL NTILE Function will assign two rank number for each individual partition. Since we haven’t used any partition, SQL NTILE Function will consider all the 10 records as a single partition. Next, It will assign 2 rank number to that 10 records. In this SQL NTILE function example, we will show you, What will happen if we assign a different value at the Integer_Value position. For instance, The following Query will use the above example query but we changed the NTILE (2) to NTILE(3). Here we haven’t used any partition. It means, SQL NTILE Function will consider all the 10 records as a single partition. Next, It will assign 3 rank number to that 10 records because we have given Integer_Value as 3.